This entertaining letter was written by 26 year-old Sgt. Alonzo Smith (1837-Aft1880) of Cornville, Somerset County, Maine. 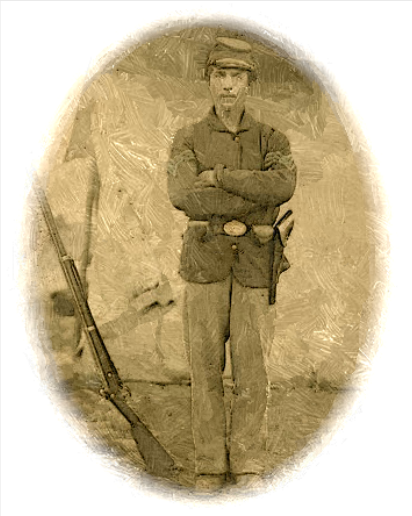 Alonzo enlisted in Company D, 24th Maine Infantry on 13 October 1862 and was mustered out on 25 August 1863. The 24th Maine was a 9-month’s regiment organized at Augusta under the command of Col. George Marston Atwood. The regiment left Maine for New York City on 29 October 1862. They were on duty at East New York until 12 January 12 1863 when they were moved to Fortress Monroe, Virginia, and then to New Orleans, Louisiana, by 14 February 1863. They were then moved to Bonnet Carre, Louisiana, on 26 February 1863 where they remained until May. Some of the regiment (not Company D) participated in the expedition to Ponchatoula and Amite River (March 21-30) and captured Ponchatoula on 24 March. The regiment then participated on the expedition to Amite River (May 7-21) and to Civiques Ferry (May 10). They were part of the advance on Port Hudson (May 21-24) and took part in the assault on Port Hudson (May 27 and June 14). After the surrender of Port Hudson, the regiment was ordered home where they were mustered out of service 25 August 1863. 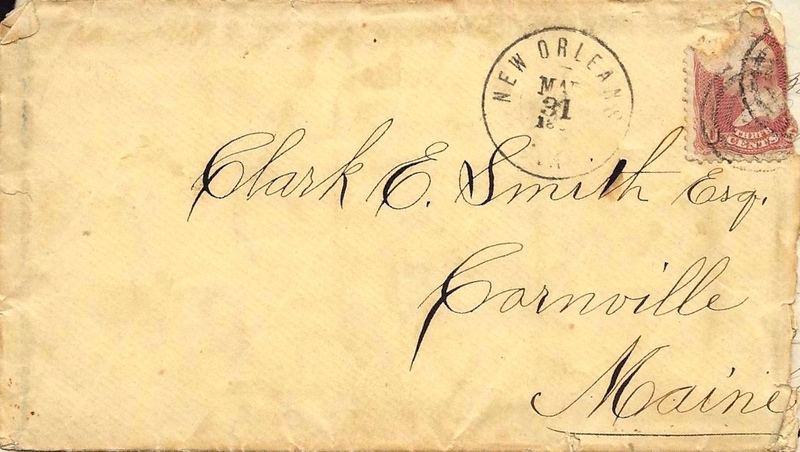 Alonzo wrote this letter from Bonnet Carre in St. John Parish, Louisiana, on the west bank of the Mississippi River. He tells his hometown relative that the regiment has suffered considerable sickness and numerous deaths from fevers and dysentery. Regimental records show that 190 men (19% of the regiment) died from diseases — most of them in Louisiana. I find on comparing dates that considerable time has elapsed since I saw you and that we have not but little longer to stay here and consequently if I would fulfill my promise to you, I must do it soon. So I set about it this day — having time and opportunity. I have written quite a number of letters since I enlisted but have not received as many. It makes one feel quite agreeable to receive letters from home and friends when he is far away and in the enemy’s land. We have had two mails since we came here but there was nothing for me — it didn’t come. I wrote a long letter to Christiana when at New Orleans and I have written one to Eunice since our arrival here. Probably they have received. I hope to know it soon. We have been here just a month today. We are encamped on the left bank of the river and at a place they call Bony Cary but spell Bonnet Carre. There has been till recently three regiments here, but now there are only six companies — the rest having gone up the river for a short time to look after rebels. There is quite a collection of houses here but it is a low, stinking place. The buildings are all — so far as I have seen — built along the river. The land appears to be cleared back from the river from one to two miles. Beyond is the dark, dense forests. The land is very flat and moist and all has to be drained. But it is very fertile. The surface of the river is from five to eight feet higher than the surrounding country. This is peculiar and is a characteristic that I do not admire. It seems like being in a foreign country. The people all talk the French language and negroes are numerous. And then the customs and ways are different from those of the beloved Yankee Land. I have been pretty fortunate thus far, so far as regards health, and have not seen much hardship. But I tell you, Clark, I shall know how to prize the pleasures and privileges of home if I should be so happy as to return to my native town. The picture presented to view here has been a sorrowful one and tends to give one a dislike of military life. But Old Death is abroad in the world and he has been reaping a rich harvest here. Our company has lost five at this place. Fevers and dysentery kill them. Men seem to die easy here. They will be sick a short time and then drop to sleep to wake no more. How many have died out of the regiment I know not, but the number of deaths in other companies will not average with ours. They have been fewer. I am happy to say, however, that the health of our company and regiment is improving. Deaths are not so frequent. For a time we buried two or three a day. We — our company — have but one in the hospital now. That is Nathan Baine — not very sick. We have quite a number that are unwell but are improving. All have the diarrhea — and such an exercising of the bowels and stomach I never heard of before. It beats all. And myself? Have I escaped? Ah no! Poor me! I have been sorely afflicted day and night. But I am nearly well now, am feeling first rate and am recruiting — gaining in strength and weight — and have concluded that I should survive the ravages of this diabolical bowel complaint. The weather has not been very warm yet. Thunderstorms are quite frequent. For two days the weather has been quite cool. Everything here denotes a warm sun and a productive soil. Clover is in blossom and the trees are green with the new and luxuriant foliage. All the trees are not green the year round. I saw green vegetables in New Orleans market the 20th of February. This is a productive country but curse the climate. As for news relating to the great war that is making this part of the country a waste, I have none of importance. We don’t get any papers very often and as near as I can find out, there is not much doing toward putting down the rebellion. It is dragging along in the same old way. I believe fate is against us. I doubt about there being many true Unionists in this section. Those that remain are forced to appear so by force of circumstances. As we were coming up the river, in only three instances was there a manifestation of Union feeling by white citizens. The negroes most always saluted us with a wave of the hat or handkerchief. The whites — most of them — appeared sullen and morose, and I believe wished us no good. I admit, however, that my opportunities for ascertaining the facts in regard to the feelings of the people have not been extensive, but I believe from what I have seen and others have told me, that what I have said is near the truth. Since I have been here, quite a large force has passed up the river and several gunboats also — all to operate against Vicksburg, I suppose; after the rebels get all ready for us. I don’t expect our regiment will see any fighting, nor do I think it will be of much benefit to the government. Nor will any of the nine month’s regiments. It was bad policy to enlist men for so short a time. What is your opinion of the war, Clark? [P. S.] Be generous of your view with a critic’s eye. Remember where I am. This entry was posted on Sunday, September 21st, 2014 at 10:13 pm	and posted in Uncategorized. You can follow any responses to this entry through the RSS 2.0 feed. I find this blog entry of great interest. The Alonzo Smith noted here is my great grandfather and I am in possession of some of his civil war medals and mementos and his own life story where he recounts, along with much else, his experiences at Bonnet “Carrie” at the time of his letter to Clark smith. I wish to learn more details surrounding this letter.